in fact, it is designed to simplify your life." How do we begin? First, a complimentary, no-obligation consultation will take place between you and The Chef through email, phone, or in person. During the consultation process, you and The Chef will discuss your and your family's dietary requirements/restrictions, taste preferences, and cuisine style to determine what type of menu would be best for you. The Chef will research, plan, and develop a custom menu designed around your specific requirements and desires. Once The Chef has created your final menu, it will be emailed to you for your approval. Upon approval of your final menu, your service date will be booked and confirmed. On the morning of your service date your Chef will hand-select the freshest, highest quality ingredients available for your service. 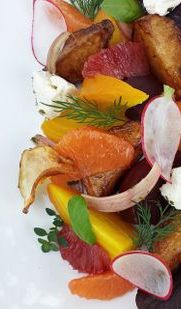 Hallie Norvet Personal Chef Service source all ingredients from local markets and specialty stores here in Los Angeles. Organic ingredients free of pesticides, hormones and antibiotics are used in lieu of conventional ingredients whenever possible. The Chef will arrive at your home with their equipment and groceries to prepare and cook your meals. Each meal is cooked fresh in your home to your personal specifications. Your custom meals will be packaged, labeled and stored with complete handling and heating instructions. Ready for you to enjoy on your time and your schedule. Done! The food fairy has finished and your kitchen will be cleaned just as The Chef found it. The only thing remaining will be the welcoming aroma of freshly prepared meals, and a fridge stocked full of delicious food.